Lydia and I had loads of fun styling this table for The Daily Meal. We wanted to recreate the feeling of an elegant outdoor restaurant at home, so we played with my nicest indoor pieces. 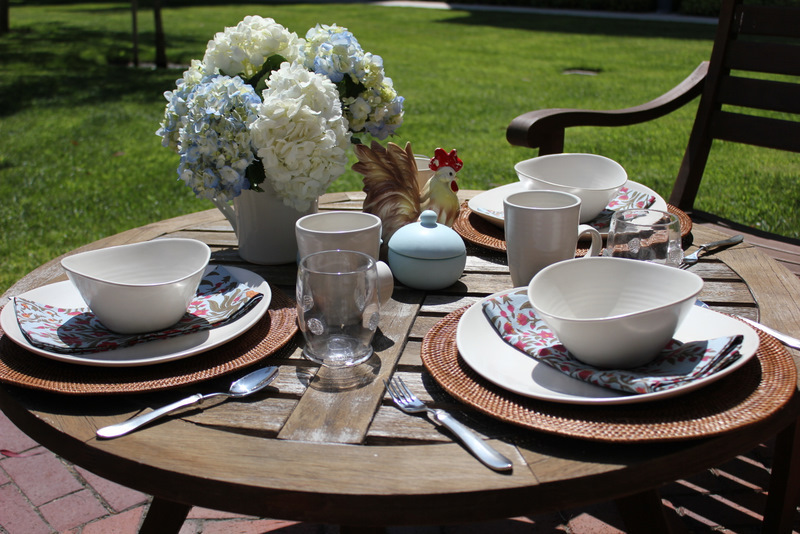 Using 1 set of pottery, 1 set of chargers, 1 set of flatware and 1 table we created 2 beautiful looks: breakfast in the garden with friends and an elegant candlelit dinner for two. For breakfast we fell in love with hydrangeas in cloud colors. We set them in my favorite juice pitcher and built the rest of the look around that. The sugar and creamer as well as the napkins pick up on the beautiful sky blue petals. And what says morning more clearly than a rooster? This one is part of an antique rooster and hen pair that my aunt gave me as a wedding gift. It’s a happy table that invites you to linger over flaky croissants and chunky mugs of hot coffee. 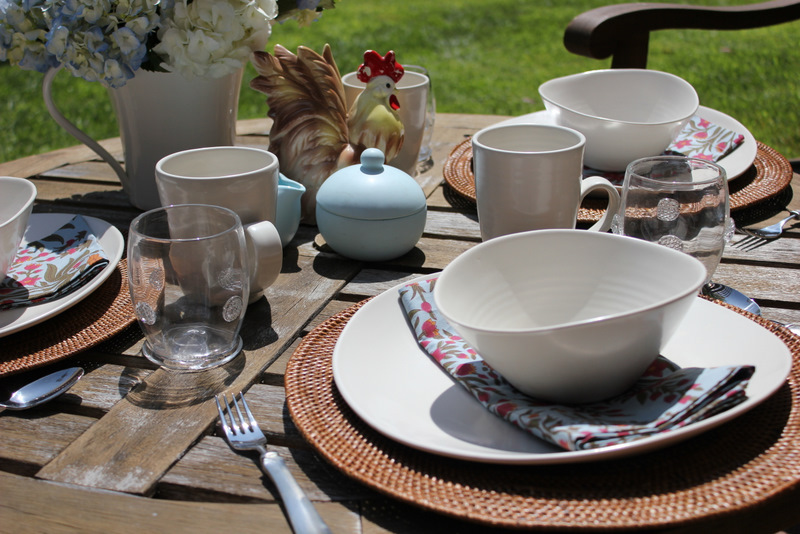 Tell us, how would you make your outdoor table special? Plate, Bowls, Mugs and Pitcher, Barre by Simon Pearce. Glasses by Juliska. Napkins and Chargers by Pottery Barn. Antique Rooster. Creamer and Sugar by Nigella Lawson. Flatware by Match Pewter. Love roosters! I have a set of rooster egg cups that I’ve had since I was 7. (Don’t ask me what made me pick out egg cups at a kitchen store at such a tender age, but I guess my entertaining instinct came early.) They’re one of my most prized possessions.